You spend a lot of money buying a DSLR camera. Wouldn’t it be great to learn how to use it so that you can leave auto-mode behind for good? Yes, I thought so. When you are finished reading this guide, you will understand all the essential modes and functions of your DSLR camera. Until you get to practical experience with a feature in your camera, it remains a fancy but a somewhat mystic feature. You might as well have bought a camera without it. For instance, exposure compensation is a great feature that is meant to help you out in certain situations. However, many photographers don’t use it or at least not for the first year of owning their camera. With this guide, you can jump to a level of control over your camera, so the camera will work as an extension of your creativity and vision. 1.5 Which Shooting Mode Should You Use? 3.1 What metering mode to use? 5.1 What release mode should I use? 6.3 Which AF-mode and Focus points to use? 8.1 What is White Balance? 8.2 What White Balance Settings Should I Use? 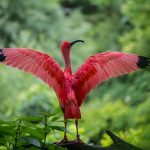 The best way to get a better understanding of your camera and to develop as a photographer is by beginning to explore what is beyond your DSLR camera’s auto mode. You do this by changing the shooting mode on your camera. Changing the shooting mode gives you control or partial control of exposure factors like aperture, shutter speed or both. How to Change The Shooting Mode On Your Camera? 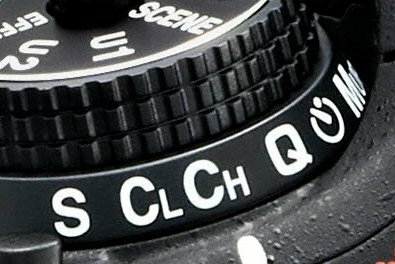 Most likely your camera will have a dial on top of it labeled with: “Auto, M, A, S, P” (Nikon) or “A, M, Av, Tv, P” on a Canon camera. The dial will probably also have some kind if “Scene” and/or “Effects” shooting mode, which are variations of the Auto mode. Don’t worry if your shooting mode dial looks a little different. Just turn the dial to the desired shooting mode. In the “Auto” mode, the camera will control everything about the exposure, including shutter speed and aperture. However, the other shooting modes will give your more control depending on the particular mode. Use the Shooting Mode Dial to change which shooting mode you want to use. This is usually the first thing you should check when you turn on your camera. To find your shutter speed and aperture values, you can use your camera’s top display if it has one. Note that the shutter speed is often displayed as fractions of a second. When it says 800, it actually means 1/800th of a second. In the aperture priority shooting mode, you get partial control of the exposure by controlling the aperture setting. The camera will change the shutter speed according to the aperture value you select and ISO-setting dialed in. The aperture mode is useful when you want to control the depth-of-field (how much of the image that is in focus). When you change the aperture value, you will increase or decrease the depth-of-field. The aperture value is measured in f-numbers, like f/2.8 or f/11, also termed F-stops. If you want a low depth-of-field, just lower the f-number to something like f/2.8 or F/4. If you want to increase the depth-of-field you can turn the command dial right to increase the aperture to a higher f-number value. At a low f-number, you let more light into your camera, which allows your camera to use a faster shutter speed for a balanced exposure. On the other hand, if you want a greater depth-of-field (more front-to-back sharpness), you will have to use a higher aperture value, which means that less light hits the camera’s sensor. To compensate for this, when using aperture priority mode, your camera will decrease the shutter speed. With a longer shutter speed, more light will enter the camera and give a well-exposed image. 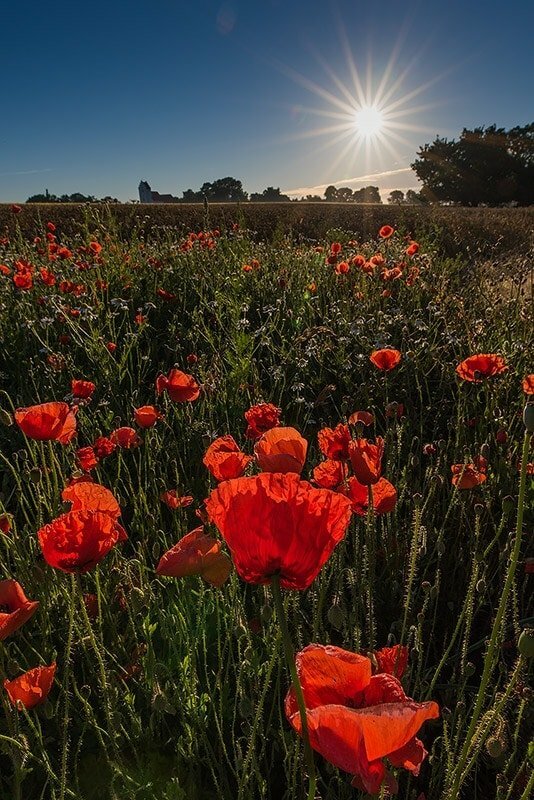 This photo of poppy flowers in the morning sun is taking at f/20 to get front-to-back sharpness in the image. 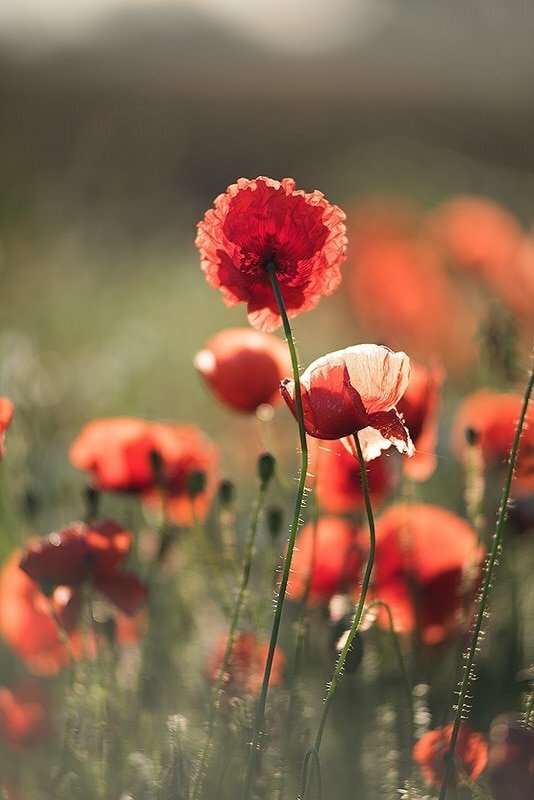 This shot of the same poppies is taken at an aperture of f/3.5, which gives a narrow depth-of-field. This makes the background blurry, to focus is more on the poppies in the front. If you want to isolate your subject from the background, you can use a lower f-number like below f/4. This is useful for portraits or wildlife shots where you want the background to become blurred. If you want to capture a stunning landscape, you would most likely want everything from front-to-back to be in focus and sharp. Therefore you should use a large f-number on your camera. Dial in something like f/13 or a higher value. In aperture mode, you can take complete control of depth-of-field. You control the aperture settings (f-number value used for the exposure). A low f-number value, like f/2.8, gives you a shallow depth-of-field with only a small portion of your image in focus. A large f-number value, like f/16, gives you a greater depth-of-field (more front-to-back sharpness). A low aperture value lets more light hit your camera’s sensor. A large aperture value allows for less light for your camera to pick up. Thus your camera needs to use a slower shutter speed to keep the exposure balanced (if you keep your ISO fixed). Your camera controls the shutter speed. Shutter Priority mode the opposite of aperture mode. You get control over the shutter speed duration, while the camera automatically adjusts the aperture settings based on the ISO-setting and the shutter speed you selected. Shutter speed is the time your camera allows light to hit the camera sensor, just like when you open your eyes you can see but when you close your eyes again no more light and visual impressions will pass on to your brain. The shutter acts just like your eyelids when opening and closing to allow light impressions to enter the camera so it can capture the image. Shutter speed is measured in seconds (like 1”) or fractions of a second (like 1/60 for one-sixtieth of a second). 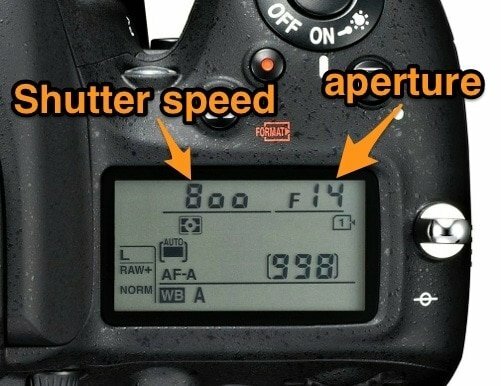 These are the shutter speed values that you will see on your camera’s display. However to save space on the display it might just show 60 for 1/60th second, like on the image of the top display above. If you use a fast shutter speed, you can freeze fast-moving subjects, like fast moving cars, wildlife or sports. 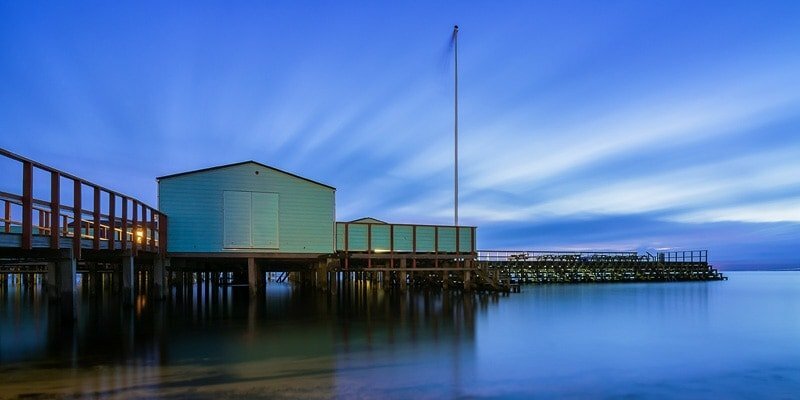 If you use a longer shutter speed, you can create motion blur in both a single subject, but also in an entire landscape, where clouds turn into long streaks and water with very long shutter speeds get a silky smooth look. As you can see the shutter speed allows for a lot of creativity. Just remember that slow shutter speeds often require that you put your camera on a tripod so you can keep the camera steady while the shutter is open. Here you can see, how a fast shutter speed like 1/1000 sec. can give you a sharp photo, while a slow shutter speed (slower than 1/30 sec.) can help you show that the subject is actually moving. Shutter speed is a tool that can help you to show what you would like to emphasize in your photo. You should use shutter priority mode when you want to control whether movements should be visible or not in the image. 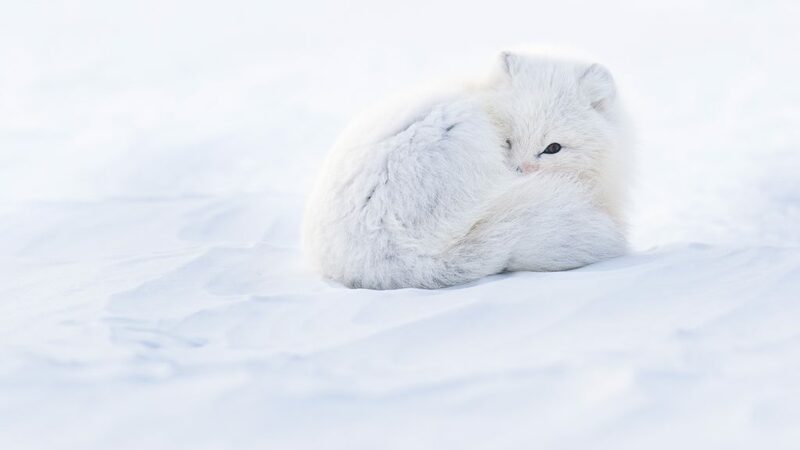 Use shutter priority mode if you want to be absolutely certain, that you freeze the subject as with moving wildlife, where you want it to be completely sharp. 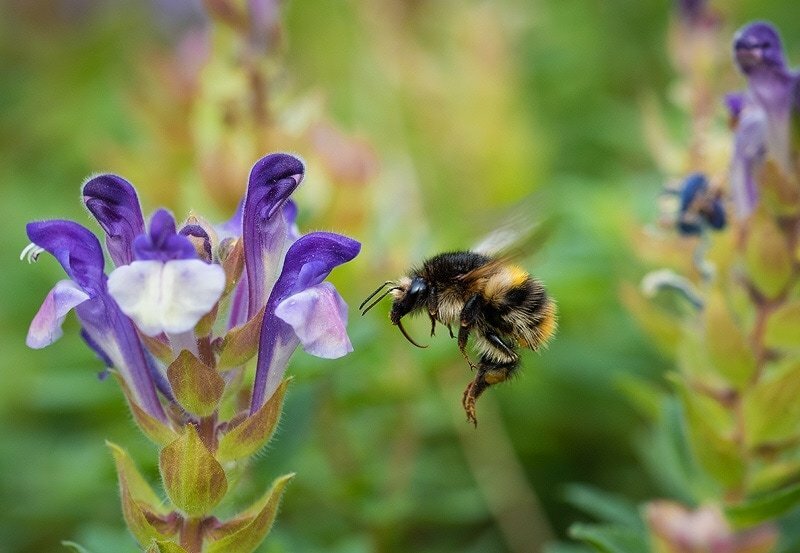 To capture this bumblebee hovering in the air, I used a shutter speed of 1/1000th second. You can also use the shutter priority mode if you want to be sure, that you can see that the subject moves. Or dial in a slow shutter speed and follow the subject with the camera, while shooting. This technique is called panning and you can get great results, where the subject will remain sharp, but the background will show movement streaks behind the subject, indicating speed. 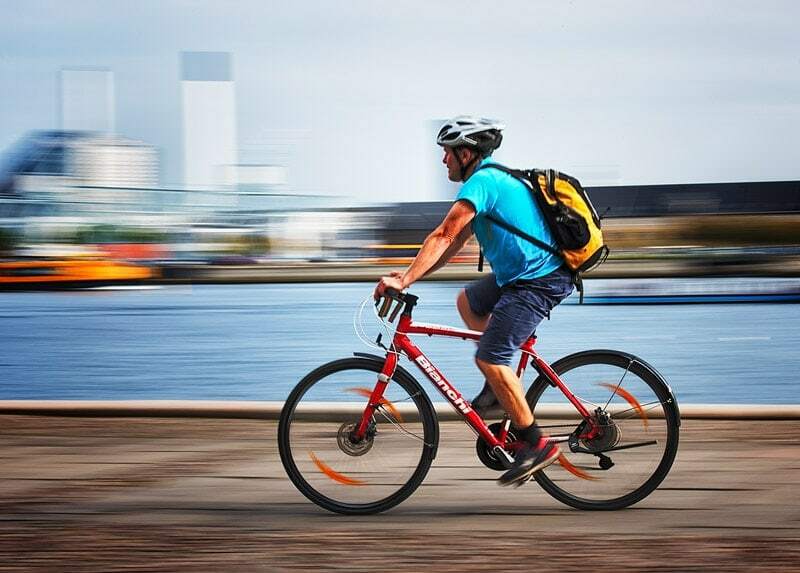 As mentioned above you can use a technique called panning to create motion in your images. Set your shutter speed at around 1/10 – 1/30 sec. and follow the subject, while pressing the taking multiple shots. Finally, when you use a tripod and want to capture waves withdrawing from a beach or transform fast moving clouds to streaks across the sky, you need to have control of the shutter speed by using either shutter priority mode or manual mode. To capture the clouds moving across the sky in this photo I used a long shutter speed of 184 seconds. This of course also required the use of a tripod to keep the camera steady and ND-filters to avoid over exposing the image. Visit Lightstalking.com to learn more about how shutter speed affects what you photograph. You control the shutter speed. The shutter speed is measured in seconds or fractions of a second. A fast shutter speed will only allow light to enter the camera for a short period of time, why the camera will have to compensate with a large aperture opening (low f-number) to balance the exposure. Thus a faster shutter speed gives a lower depth-of-field if you keep your ISO fixed. In shutter priority mode the camera controls the aperture. In program mode you can control both the shutter speed and the aperture, but with your camera’s assistance. If you adjust the shutter speed the camera will maintain a correct exposure by automatically adjusting the aperture. If you, on the other hand, adjust the aperture, the camera adjusts the shutter speed. You have the freedom to change both, without needing to switch between the aperture priority or shutter speed priority modes. In manual mode, you get full control over the exposure. You set the aperture and the shutter speed yourself, with help from the exposure indicator that tells you, whether the the current setting will give you a correctly exposed, underexposed or overexposed image. You need to change both settings before making the shot. However, if your camera has two command dials, you can get a hang of this very quickly. There are many situations, where you would i.e. prefer to have your photo a little underexposed, to be able to use specific settings. 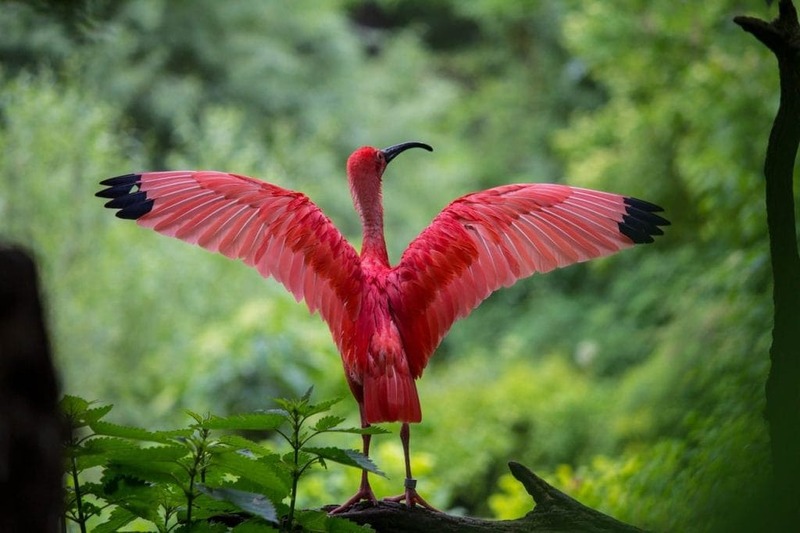 For instance, if you are doing bird photography in less than perfect light conditions you might be able to accept that the exposure is 1 or 2 stops underexposed, to maintain an aperture that keeps the whole bird in focus and a shutter speed of 1/1000th of a second to keep a flying bird sharp without movement blur. In any of the other shooting modes (aperture, shutter speed, and program mode), you don’t get this kind of control. Which Shooting Mode Should You Use? I suggest that you use anything but the automatic mode. As a first step get familiar with the aperture priority mode for anything without a fast moving subject. When you are photographing (fast-)moving subjects switch to shutter priority mode. Once, you get a hang of both mode, make the switch and get comfortable with using manual mode. It will give you more possibility to get creative with your photography. However, this doesn’t mean that you should shoot in manual forever. For my landscape photos, I often use priority mode. The ISO controls how sensitive to light your camera is. The higher ISO value, the higher sensitivity, and the brighter an exposure you will get. In low light situations, you can bump up the ISO to be able to keep your preferred shutter speed and aperture settings. 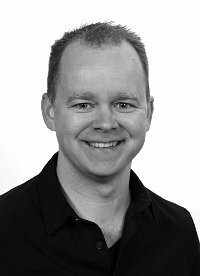 The cost of using higher ISO values is increased digital noise and therefore lower image quality. However, if you are below ISO 800, you will usually have no problems. If you use a high-end DSLR camera you will be able to go even further without noticing a drop in image quality. From left (i.e. ISO 100) to right (i.e. ISO 3200) you can see how a change in ISO affects the image quality. The ISO is usually part of the exposure triangle, however, it doesn’t have it’s own dial like shutter speed and aperture does, even on high-end cameras. You often don’t need to change it from image to image, but more likely when you move from one type of scene to another, like when you go from shooting outside to inside, or if the scene suddenly gets a whole lot darker. 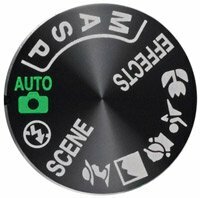 Many cameras have an auto ISO mode, which is really neat, as it takes one factor out of balancing the exposure in the manual or semi-manual modes. I usually have my camera on Auto-ISO. When I want to make sure, that I use a very low ISO for the best image quality, I will switch off the Auto-ISO and set the ISO manually. But at other times, I just let the camera decide. Even though a high ISO decreases image quality, don’t be afraid of using a high ISO on a modern DSLR camera. Camera sensors have improved dramatically along with photo editing software’s ability to remove noise in post-production. I have explained more about how ISO works in the guide to understanding shutter speed, Aperture, and ISO. No matter, what shooting mode you use, your camera will try to find out or measure what will give a correct exposure for your image. Either it will use it to change the camera settings for you in the automatic or semi-automatic modes or it will use it to show you the exposure indicator that you see in manual mode. Your camera tries to calculate a ‘correct’ exposure based on the bright and dark areas in the entire scene and changes the exposure values (aperture, shutter speed, and ISO) so that the average tone value equals 18% gray. This is often referred to as middle gray. You can control which areas your camera uses to assess the tones in the scene. This can come in handy in complex situations and gives you greater control over the exposure. Normally, your camera will give you three different metering modes to choose from. However, some professional cameras (like the Nikon D810) will have a neat extra metering mode called Highlight-Weighted Metering. In the average metering mode, the camera assesses the tones in the entire image from one corner to the other corner. Based on this assessment (and according to the shooting mode) it changes the exposure values so it equals 18% gray. 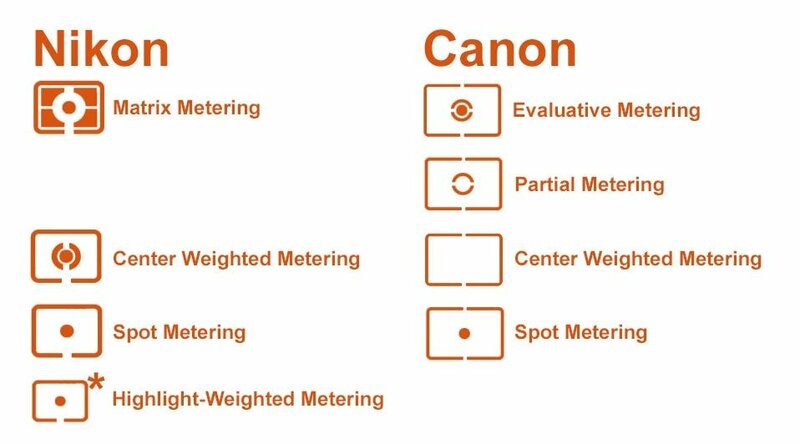 When using centre-weighted metering, your camera will only use approximately 80% from the area in the center of your viewfinder instead of the entire scene to evaluate how to determine the best exposure. This means that any highlights or shadows in the extreme corners of the viewfinder don’t affect the exposure. In spot metering mode, your camera will only use about 5% of the entire image to find the correct exposure. Depending on your camera, a small circle in the center of the viewfinder will show you what is used for the evaluation. In other cameras, the main focus point is used as the basis for averaging the exposure to 18% gray. If you have an AE-L button on your camera you can lock the spot-metering to a specific part of the scene. Place the focus point on the area you want to use and press the AE-L button to lock the metering to this spot. Now, recompose and take the shot. The highlight-weighted metering mode allows you to easily expose for the highlights and let the shadows take care of themselves. Blown out highlights are more difficult to recover than dark shadow areas. Thus it makes sense to use a metering mode, that keeps you on the safe side of having highlights too bright to recover. The highlight-weighted metering does just that. By metering on a background that is brighter than your subject, you can make your subject turn into a silhouette. 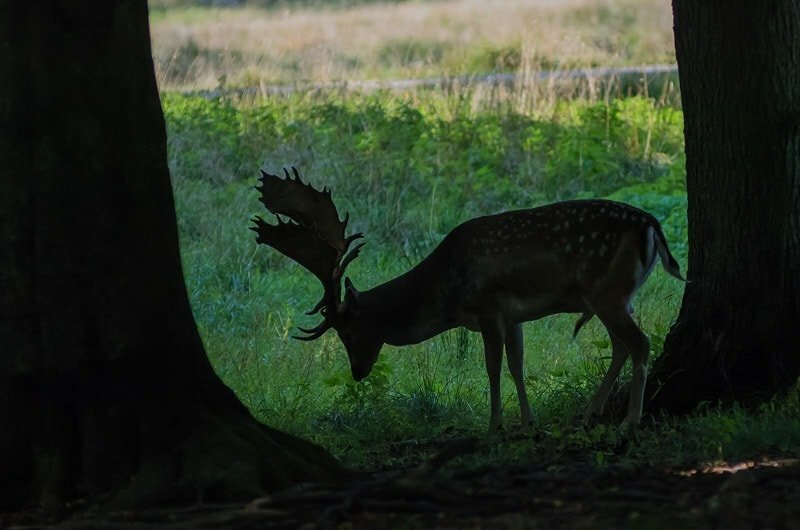 With this shot, I choose to keep some details in the silhouette of the deer, as silhouettes can look kind of “cut out” if the silhouette is completely black. Use spot metering and lock the metering on the background by pointing to it with the active focus point or meter spot and press the AE-L button, to make the camera meter for the bright background. What metering mode to use? As a beginner, I suggest that you stick to the average or center weighted metering mode per default. They are a good starting point. With time and experience, you will find out, when a specific metering mode can help you achieve the result you are after. If you, for instance, want to create a silhouette effect in your image, you might want to switch to spot metering and meter for the bright background lock the metering with the (A-EL) button. This will make your subject dark as a silhouette. In most situations, the camera’s metering gives a correct exposure for your images. However, there are situations where the metering is a little off target. 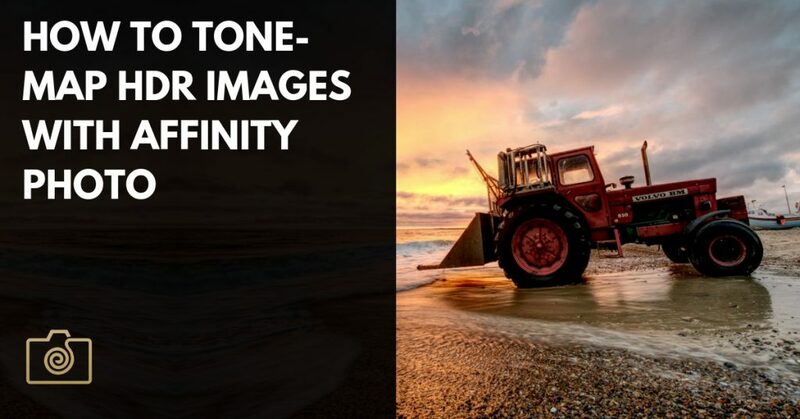 If you point your camera at something very white, like a snowy landscape, a white-walled town or even at the beach, you will get an image that looks a little darker and grayer than what you see. This happens because your camera tries to average to 18% gray, with the result that what should be white become a grey-dull-looking-white. If you point your camera at a very dark area and take an image, you will also notice that the result will be a bit brighter than what you see. Again this is because of the camera ‘thinking’ that the optimal exposure is 18% gray, but since there are no bright colors in the scene to balance out the dark ones, the camera pulls the exposure in the wrong direction, and you get a less than optimal exposure. In the section on exposure compensation, you will learn how to fix these issues. When the exposure doesn’t come out the way you want or suspected it to, you can override the exposure with the exposure compensation button. On most cameras, you will find the exposure compensation button near the shutter button. The exposure compensation button allows you to change the default meter reading in the camera, to compensate for the actual brightness/darkness of the scene. It’s the button with the +/- icon. 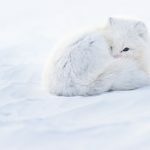 If most of the tones in your image are bright (like snow and the like), the camera will typically render it too dark or gray, because it tries to average the exposure to 18% gray as explained above. In this case, you can use the exposure compensation button + the command dial to add a positive exposure compensation, like +1 stop. This will let your camera know that you want the exposure to be brighter than the 18% middle gray. How many stops you should add in exposure compensation depends on how much difference there is between the scene and the default exposure. Just take a test shot to check it, in those situations, where you think that the camera will be off target on the exposure. To the left, you see the shot I came home with. The walls of this house were white, but the camera got tricked in this situation because of large amounts of white tones in the image. To the right, you can see the exposure compensated result (done in post-processing). If I had been smart enough I would have used the exposure compensation in camera and gotten a better result, straight out of the camera. If you have a scene, where most of the tones are dark, your image may end up too bright. To change this, you can dial in a negative exposure compensation value using the exposure compensation button + the command dial. This will tell your camera that you want the exposure to darker than the usual 18% gray. Release modes help you tell the camera what to do when you press the shutter. Should it take a single image or several? On many cameras you control the release mode by using a dial on the top of your camera or it will be hidden away in a menu to maintain a simple and user-friendly camera layout. Check your manual to find out where you can change the release mode on your specific camera model. In the shutter release mode, the camera will just take a single image when you press and hold the shutter button. In continuous exposure mode, the camera will continuously take images as fast the set shutter speed and your camera’s buffer allows, as long as you press the shutter. CL stands for Continuous Low and will typically let you shoot 3-4 frames per second. CH stands for Continuous High and will let your camera shoot at its max frames per second. For the times when you want to be unnoticed while photographing a sleeping child or a wild animal up close. I should say that the quiet mode is not completely silent. However, it is less noisy compared to the other release modes. MUP allows you to lock the camera’s mirror in its up position. When doing static shots on a tripod, even the slight movement that occurs when the camera raises the internal mirror to create the exposure can create a bit of blur to your photos. To avoid that you can activate the MUP lockup release mode, which raises the mirror the first time you press the shutter. Next, after a few seconds, you can push the shutter again to take the picture. At fast shutter speeds this movement will not be visible, but when taking photos on a tripod using a little slower shutter speeds, the Mirror UP mode might come in handy. Note, that when the mirror goes up, you cannot see through the viewfinder, so you might want to turn on live view when using the mirror up mode. This is the family selfie mode, for those occasions, where you also want to be in the picture. You can set delays and the number of shots to take and how long an interval you want between those shots. There are of course many other uses for using a timer, to get a delay between pressing the shutter and the shot is taken. What release mode should I use? In 90% of the times, you will probably want to use single exposure mode or continuous exposure mode. Since there is no cost to taking an extra image, you might as well just leave your camera in continuous exposure mode all the time, until you specifically need to use one of the other modes. All DSLRs allows you to choose between different focus modes to give you more control of how the camera’s focus system should help you achieve the image you want. Knowing how to use and master the different focus modes will help you achieve focus right where you want them in your images. Basically, there are two different ways your camera’s autofocus works. Either it will focus a single time (AF-S on a Nikon / One Shot AF on a Canon) and lock it, when you half-press the shutter or it will continuously (AF-C on a Nikon / AI Servo on a Canon) try to find focus on whatever you point your camera at as long as you half-press the shutter button. On a Nikon D7100, you can change between the focus modes by pressing the Focus mode selector button and turning the command dials, to scroll through all the modes. In AF-S/autofocus-single mode, you need to release the shutter button recompose and half-press it again to change the focus. In AF-C/autofocus-continuous mode you can just continue to half-press the shutter while recomposing and the camera will refocus continuously. 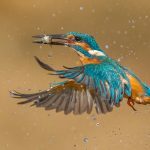 Even though this might seem great, note that the focus will also “jump” or shift more easily as you might move the focus point off target between focusing and pressing the shutter completely down. The single autofocus mode (AF-S), which is the default, should be used when you take photos of stationary and non-moving objects like landscapes, buildings, and people. 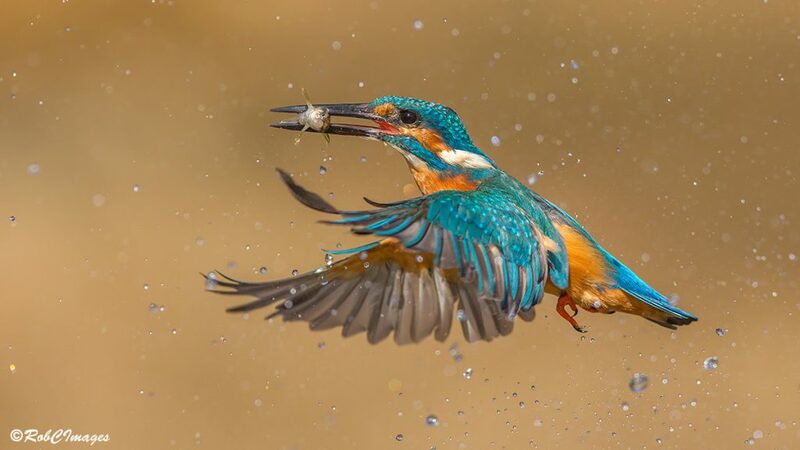 For moving objects, where you want to keep the moving object, like a bird, car or a moving person in focus, you should switch to using one of the continuous autofocus AF-C modes, where the focus keeps on adjusting as long as you half-press the shutter button and follow the subject. This makes sure that when you are ready to take the photo your subject will be in focus. The continuous autofocus mode is more flexible and configurable on high-end DSLRs than the single autofocus mode. No matter whether you use AF-S or AF-C your camera relies on focus points to achieve focus. If you look through your camera’s viewfinder, you will see an overlay showing a number of squares across the viewfinder. If not, you can probably activate focus point display in the menu. Half-pressing the shutter to make the camera focus, will highlight one of these squares. What your camera is telling you, is which focus point is the active focus point. This is where the camera is focussing or attempting to find focus. New DSLRs have over 50 different focus points. There are several advantages to having a lot of focus points. It gives you freedom when composing, as you can select which specific focus point you wish to use to achieve focus, so you can compose and focus in one go. If you only had one focus point at the center, you would have to focus keeping your subject in the center and then recompose to have your subject on i.e. a third-line or in the left side of the composition. However, when you have a lot of focus point to use, you can just use the focus point that is already on the third-line where you want your subject to be in the resulting photo. You can change the focus point the camera uses, with the (arrow dial) at the back of your camera. Having multiple focus points is also very useful for fast-moving subjects like animals or sports events. It is not easy to keep the focus on a football player zig-zagging past the defense, while you try to keep a single focus point on him all the time to have your camera focus on him, and not the background. However, the Dynamic AF-Area Mode on some Nikon models like the D7100 will let you choose between using 9 focus points, 21 points or all 51 points and automatically switch between using the neighboring focus point, when it detects that the subject has moved to that focus point. You still have one main focus point to initially select your focus, but your camera can switch to neighboring as your subject moves from one focus point to the other, if you cannot precisely keep track of the subject. For smaller subjects, you should pick 9 points and if you wanted to track changes between the 9 nearest focus points, for larger subjects use 21 or 51 focus points for Dynamic AF-Area selection. Many of the more advanced DSLR (at least from Nikon) have a “3D-Tracking” mode. 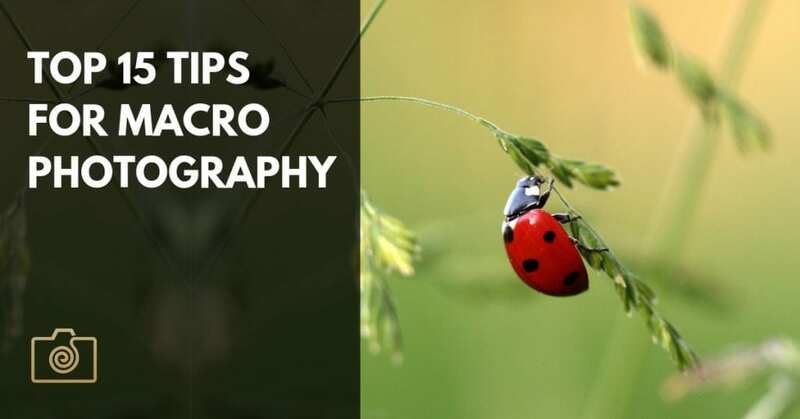 You will initially pick the autofocus point and then your camera will automatically use the required focus points it needs to track subject movement and keep focus, while you half-press the shutter. For a more in-depth and technical explanation of the different autofocus modes, visit PhotographyLife. 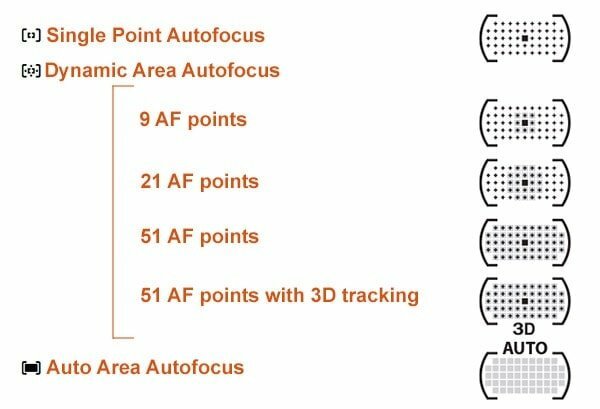 Which AF-mode and Focus points to use? Unless you are specifically photographing moving object, you can set your camera to use the single autofocus mode (AF-S). Especially in the beginning, this can be useful, while you are getting used to selecting which focus point to use. With a little bit of practice, you will soon be able to change the focus point without looking at the buttons. When shooting a moving subject switch to continuous mode. Which continuous mode depends on your subject as explained above. Over at Amateurphotographer.co.uk you can read more about changing and using the different focus modes on your camera. Modern cameras will give you the possibility to control which file type and quality your images are stored in. Even though it is possible to store more images on your memory card with a low quality, it doesn’t make sense to invest in a camera with many megapixels and then not make use of it by setting the quality to low. Instead, you should use ‘large’, ‘fine’ or ‘superfine’ or whatever your camera calls the best quality. You will also have the choice between saving your images as a RAW or JPEG file. RAW-files can contain a lot more image data, which means that you can process it more heavily in post-processing than you can with a JPEG file. 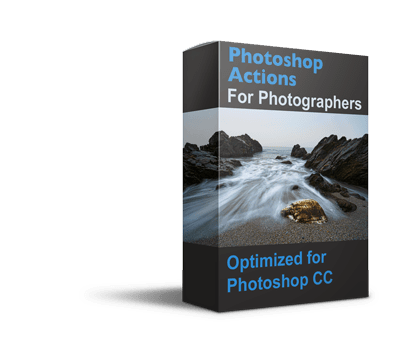 Most serious image editing software these days can handle RAW-files without any hassle. Even though it is tempting to shoot in JPEG because it makes the file size much smaller, I usually advise not to do it. Storage capacity is fairly cheap, and it is simply not worth saving a few megabytes per image, with the cost of not being able to change much or recover an underexposed image in post-processing. Note that RAW files come out a little more flat-looking and less saturated than JPEG. RAW files need to be post-processed to look great. JPEGs, on the other hand, are more print-ready. The only time I would suggest that you save in JPEG, is if you don’t want to bother with post-processing at all. Then JPEGs will look better. However, skipping post-processing is like stop working at a piece of art halfways. Most photography masters in the past also mastered darkroom techniques to achieve their result. Still not convinced to shoot in RAW? Here is 10 reasons why you should be shooting RAW! If you follow my advice of shooting in the RAW file format, changing the white balance becomes less of a hassle, as you can always change it in post-processing. If you set your camera to store the files as JPEG, you need to make sure you use the proper white balance settings before taking a picture. So again shoot in RAW, to make life easier, at the cost of some extra megabytes on your memory card and hard drive. 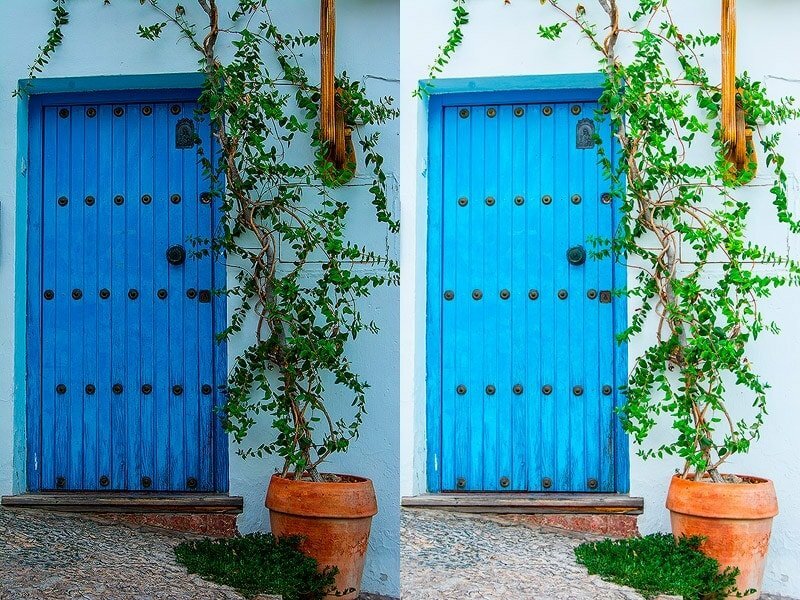 White balance is the color tone of your photos. Under some conditions, your colors may have an orange/yellow tone to it(like when shooting indoor in poor light). In other conditions, your images will come out with a blueish tone. These colors are due to different light sources, like flashes, light bulbs, the sun and fluorescent lighting), emit light in different wavelengths. This gives different color temperature to the light. Light from a setting sun or a candle flame is warm, while moonlight or light from many LED or fluorescent lighting is much cooler. Our brain can counter the effect and adjust. We see things more like we expect them to be, but the camera cannot do this. It needs to be told, how to interpret the light available. Your camera has different presets to help you choose the right white balance for certain common light conditions. First of all, the Auto WB / AWB will make the camera try to detect the predominant color and make the correct settings for you. Normally, this works quite well when shooting in RAW. If you want to set it manually, the easiest way to find the correct white balance preset is to look at what kind of light source there is at the scene. Daylight – Use it on clear sunny days. 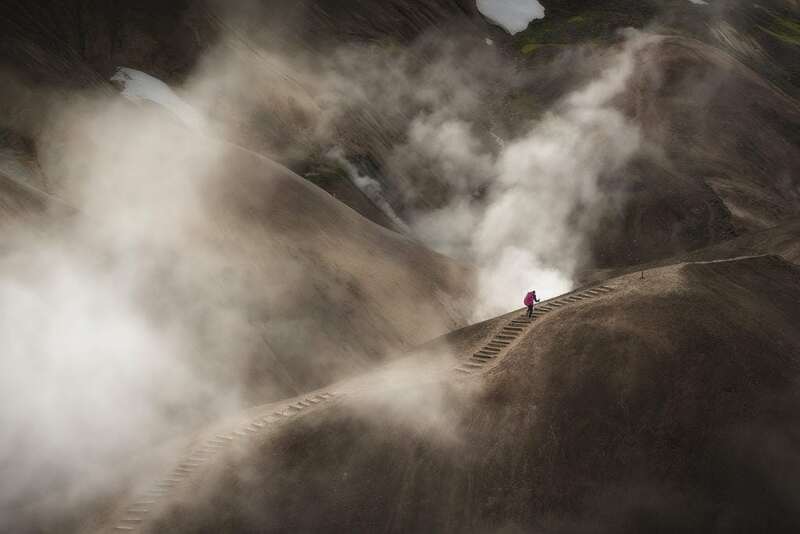 Cloudy – For cloudy days. It will add warm tones to your image. Shade – If you shoot in the shade. Shades are cooler (also in color temperature), which gives blue’ish images. Using the shade white balance preset warms up a bit. Tungsten – Use tungsten when shooting indoors, or under street lights. It cools down the yellow tones. Fluorescent – For shooting indoor in fluorescent light, which gives green/blue tones. Flash – A flash adds a cool blue cast to images. You can use the flash white balance preset to add warmth. 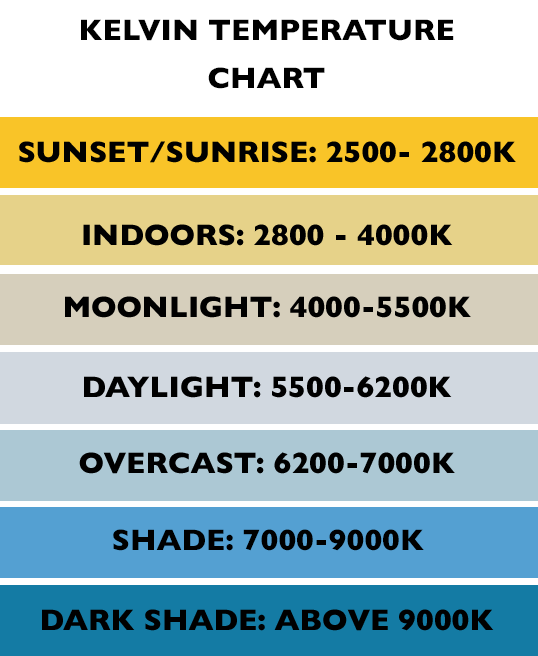 If you would rather control everything yourself instead of relying on a preset white balance, you can on many DSLRs opt for setting the kelvin color temperature yourself. You can do this by matching the light at the location with the appropriate kelvin temperature (as you can see on the chart below). If you find that your test shots are more yellow than you would like, you probably set the kelvin temperature too high, and need to lower the kelvin number so it better matches the light you have. On the other hand, if the test photos come out too blue, you need to turn the color temperature up. With the kelvin settings, you tell the camera manually, what color temperature is, instead of letting the camera try to calculate and set it automatically. Setting the color temperature yourself is, of course, more precise than using a preset. However, whether your judgment is better than the camera’s Auto-WB, depends on your experience and ability to perceive light correctly. What White Balance Settings Should I Use? Go with auto, as long as you shoot in RAW. If you really get to know the other functions of your camera well, you can, of course, try to set the white balance manually. But, why not postpone the decision to post-processing. You have the option to capture the image easier, with no ‘cost’ at all, making sure that you don’t get it wrong by shooting in JPEG file format and forgetting to change white balance when you move from fluorescent lighting indoor to shooting a sunset outdoor. 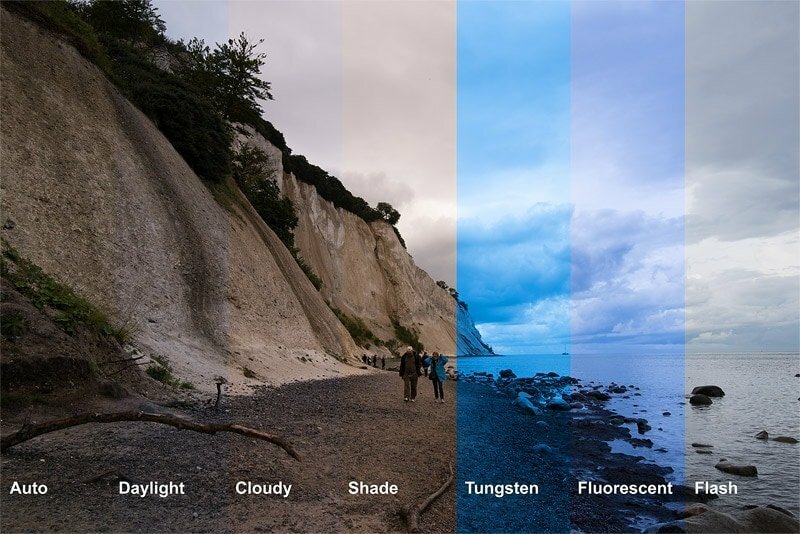 For more information, check out NikonUSA’s explanation on setting white balance. 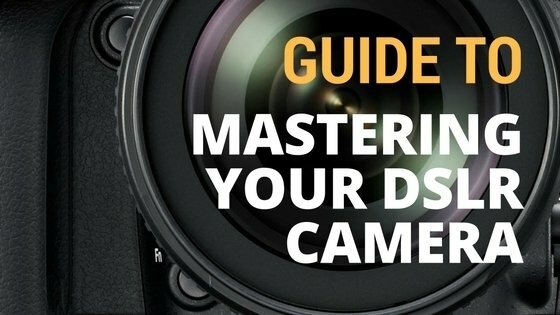 Even though you might get a solid understanding of most of the topics in this guide to mastering your DSLR, there are still a lot of buttons that will be unfamiliar to you. Especially on higher end cameras, that are almost covered with buttons. 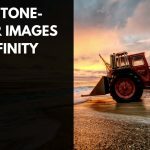 The reason you will have more buttons on a high-end camera is that it is way faster and easier to use buttons than to navigate through a complex menu system. Anyway, the most important buttons that you are likely to have on your camera will be covered here. 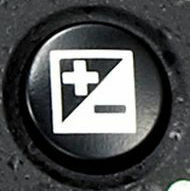 You will find an AE-L/AF-L button on most Nikon DSLR cameras. The default behavior of the AE-L/AF-L button is to lock both the autoexposure and the autofocus while you press the button. This can be useful in some situations. Especially, when your DSLR camera is set to seek focus when half pressing the shutter release button. 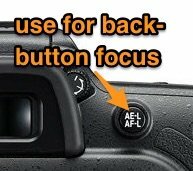 However, I suggest that you change the behavior of the AE-L/AF-L button as explained below, to gain more control of your camera’s buttons. Once you get your camera, the first thing you should do is to make sure that back button focus is enabled. It is so much easier to work with. With back button focus you remove the focusing from the shutter release button and instead use the AE-L/AF-L for acquiring lens focus. No more half-pressing the shutter release button to focus and then accidentally pressing it completely down before you finished recomposing. When you use the AE-L/AF-L button to seek lens focus, there is no need for a button to lock the autofocusing, because the shutter release button will no longer control the lens focus. When you use the AE-L/AF-L button to seek lens focus, there is no need for a button to lock the autofocusing, because the shutter release button will no longer control the lens focus. Another benefit of using back button focus is that you can set your camera to use continuous autofocus mode AF-C (instead of single autofocus mode AF-S) and then forget about it, as the camera only seek focus when you press the AF-L/AE-L button. The downside of using back button focus is that when you hand over your camera to someone else, who is not used to using back button focus the images are likely to be out of focus, since they expect the shutter release button to focus for them. You can change how the buttons work in the settings menu. I.e. on my previous D7100 I had to change the functionality of the AF-L/AE-L (from locking autofocus), to use it for focusing while the button is pressed. Check your manual, if in doubt. Again you can easily change this behavior in the settings menu. Note that you should decide whether you want to lock the exposure until you unlock it again by pressing the Fn button a second time, or you want the autoexposure lock only to be active as long as you press the Fn button. To summarize how the buttons work after these few changes: The shutter release button should only work for taking a picture. To auto-focus press the AE-L/AF-L button. To lock the exposure settings press the Fn button. When you look through the viewfinder of your DSLR camera it shows you the scene and subject with the lens using its widest maximum aperture. It is only when you press the shutter release button that the camera changes to the set aperture and captures the image. It does this to allow you to see the scene as bright as possible through the viewfinder. However, it is not so great for determining where the focus is and where the depth-of-field is located. To preview the depth-of-field and how the actual depth-of-field will look like, you can press and hold the Preview button. This will allow you to examine how much is in focus and determine whether there are too many distractions in the background at the selected aperture value or it will get blurred out. Note, that when you press the Preview button, the viewfinder will also get darker, as a result of the aperture stopping down to the set aperture value. The preview button is found on the right side on the front near the base of the lens, about midway up. On Canon DSLR cameras you will find it on the front, but on the left side near the base of the lens. The next step is getting some experience with the different features explained above. Experience with the features supersedes just knowing about them. Getting the feel of the functions in your fingers will let you be able to use them, when you need it for a shot. Thank you so much for this! Clear, spot-on explanation, great examples, beautiful photos! Very helpful. Great job! Thanks for the feedback. I am happy that you like it. Thanks for such a concise and informative article. The guidelines are a great refresher to have on hand as a quick reference. Outstanding work!